On the home page are maps that show how 92 would impact the environmentally sensitive land within South Brunswick Township. Here we show some other areas that 92 would also harm. Map of the area around the western terminus of Route 92 (in orange.) Shown in red are the roads that cut-through traffic would reasonably use to get to or from the western terminus of 92. 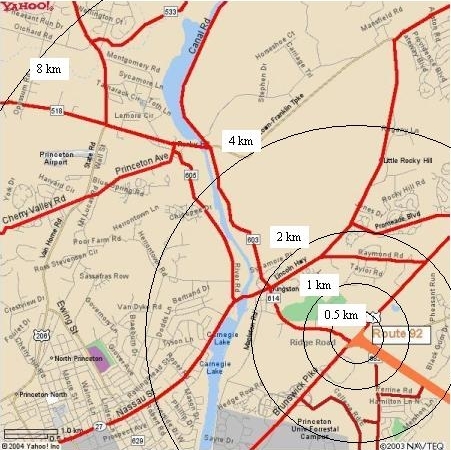 How close is your home to Route 92 Ground Zero? Click on the map for a more detailed image. The boundary for the Army Corps of Engineers DEIS exclude most of the roads to the west of 92’s western terminus. 92 traffic would not stop at Route 1, but would continue along these local roads. Lingston and Rocky Hill would be hurt the worst. Princeton Township would also be affected, even though Mayor Marchand supports Route 92. 92 traffic would impact many narrow local roads that cannot bear the added burden. Kingston, Rocky Hill, Montgomery, and Princeton Township roads would be the most directly impacted. Some 92 traffic would try to avoid the chronic traffic jams on Route 27 by using east-west local roads to the north. Not shown on this map is the planned extension of Route 92 into Montgomery. The Regional Planning Partnership is on record as favoring this extension, despite the fact that it illegally “segments” 92 to evade Federal environmental laws. “If every new road that the traffic engineers built actually reduced traffic, why do we have any traffic problems now?” -- Frank Gambatese. The focus of this map is the highway's impact on the Plainsboro Preserve. The blue lines represent stream corridors which traverse this area. Please note that the roadway and its detention basins bisect these streams, so the likelihood of contamination of the lake is eminent. Currently, this body of water is potable and has a neutral pH. The litmus test for this condition is the presence of rare water plants which are intolerant of pollutants and are part of the Natural Heritage Database. The Corps DEIS skirts these issues. If this roadway is built, the environmental health of the Preserve will be compromised forever. Also note the very close proximity of 92 to the homes of the Princeton Collection, to the immediate west of the Plainsboro Preserve. The noise pollution there will be the same as the Preserve. Please contact us at no92@verizon.net!